Our household goods and furniture arrived in July, 7 weeks after we did, but it took a little time to get all the pictures hung and acquire some new storage pieces to replace built-in shelves, cupboards, and closets that we have in our Portland condo. 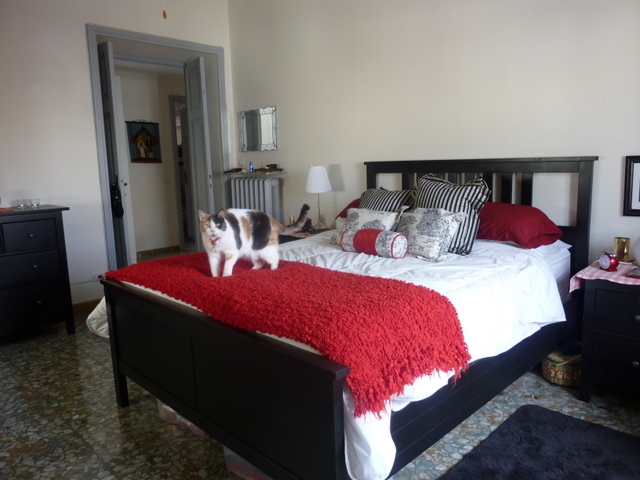 So here, at last, is a peek at our furnished digs in Roma. 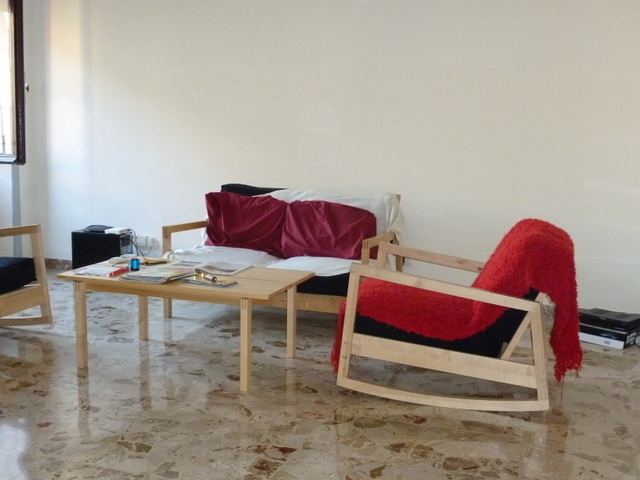 The “before” pictures are with embassy-provided temporary IKEA furniture. 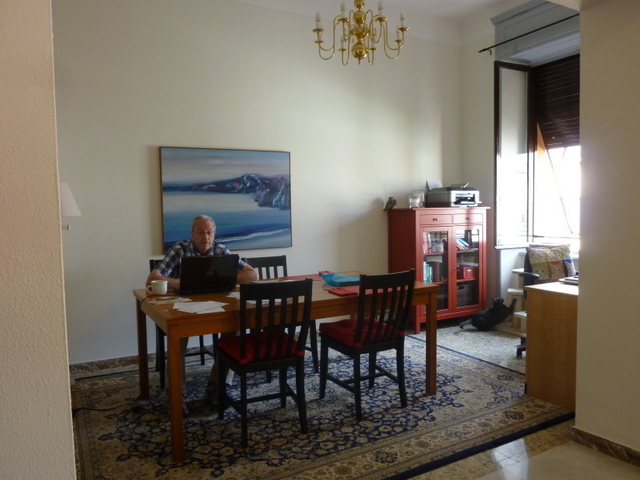 I have to say, although the temporary furniture was spartan, it was great to move right into our apartment, and not have to spend 7 weeks in a hotel room. 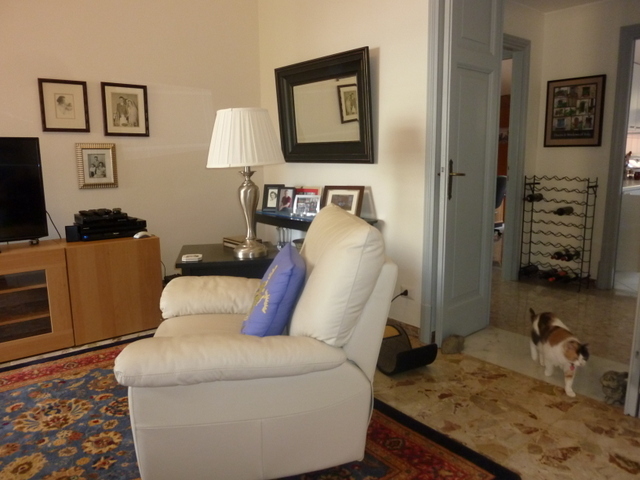 Another living room view, looking toward the hallway and kitchen, with the lovely Libby passing through. Dining Room “before.” This was our multi-purpose eating space and office. Dining Room “after.” Still partly used as a home office. My desk is in the corner to the right. 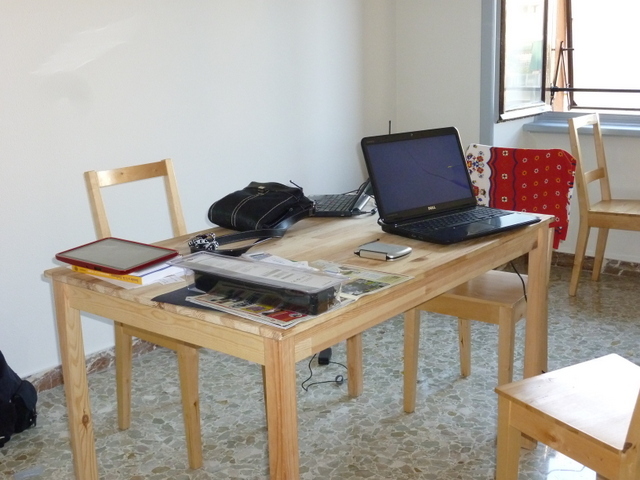 Ric’s desk is in his train room, but he hangs out with his laptop at the table so we are together. 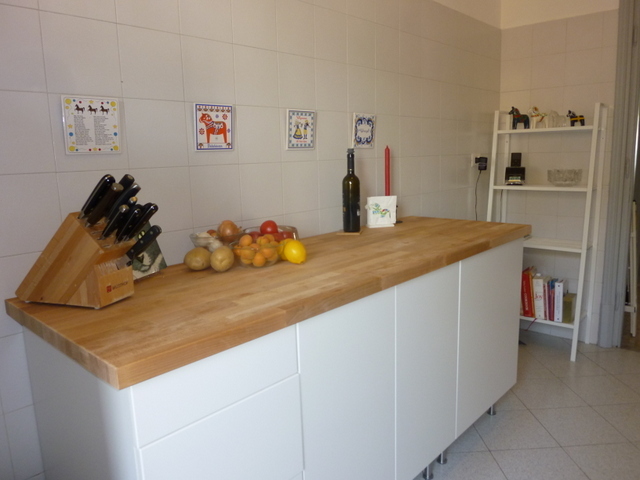 … a nice wood-topped cabinet. From IKEA, of course! Our IKEA cabinet. IKEA wanted €200 to assemble, so we scheduled a do-it-ourselves day. It was a very satisfying project. No one was injured. Forgot to take a “before” picture of the bedroom. It was quite spartan, to say the least. Libby makes another rare appearance and models one of her favorite locations. We still have some things to do. Perhaps acquire some local artwork for the bedroom, and I plan to hang some draperies before cold weather sets in. But we are “at home” here in every way. 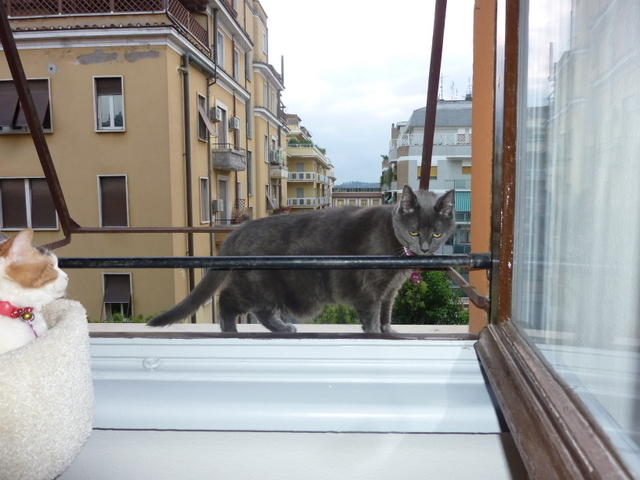 So are the cats, who have traded our small garden in Portland for a window sill 4 stories above the street in Rome. Dare-devil Janie on the (very wide) window sill. The metal braces are part of the shutter assembly. Libby watches from the cat tower. Window screens are a rarity. welcome welcome! I am looking forward to following your Roman adventures. Thanks Gillian. Happy to “find” you too! I looks just lovely. Glad you’re settled in. Your place is so beautiful and so many nice touches. I’m sure it is nice to finally have a place to call home. We look forward to seeing it. Laurel & Ric, Your Italian home is lovely. I”m glad no one was hurt during “do-it-yourself day”…being as I am all thumbs, I see that as quite an accomplishment. Apparently Jane is not afraid of heights! We have always had a certain simpatico! 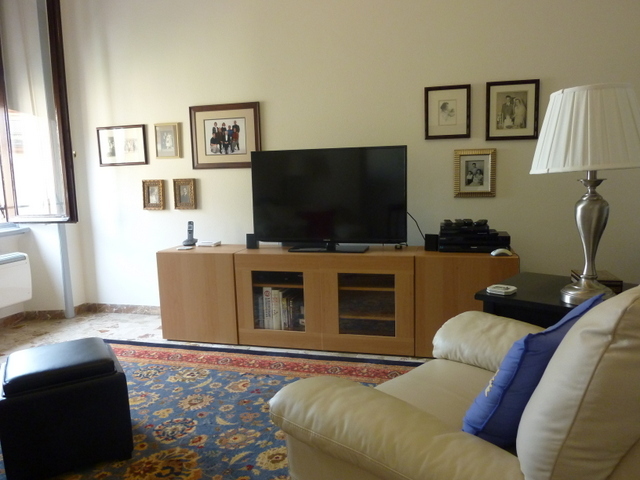 We have exactly the same oriental rug in our TV area! I couldn’t believe it when I saw the picture. We bought ours in Turkey and probably paid too much but the colors spoke to me. I couldn’t help but smile when I saw yours. 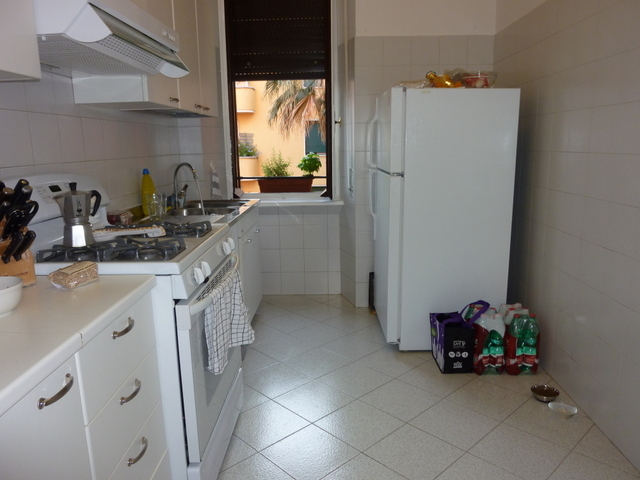 Your apartment looks wonderful and definitely more inviting than the embassy stuff. When we were in the Air Force we got loaners from time to time. It wasn’t near as nice as the IKEA! Glad you are settled and congratulations on putting together the cabinet from IKEA. It always works but Lloyd and I usually have headaches by the time we finish. That’s what a good Italian Chianti can cure, right? Looks wonderful!! Have a wonderful October! Much love from the Pacific Northwest!! 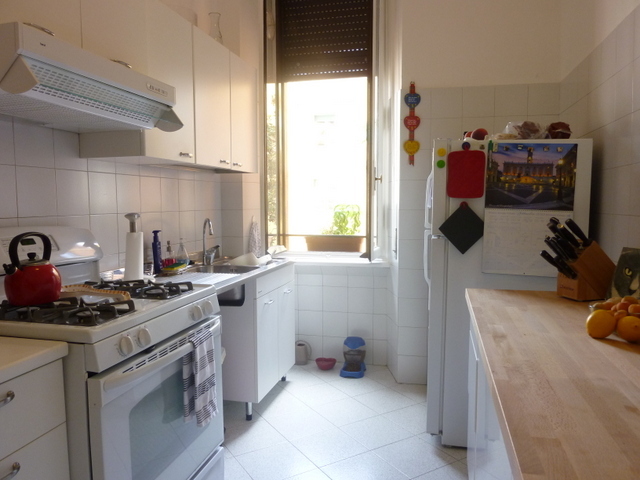 You have created a wonderful home in Rome – the window views are so, well — Italian – gads – how wonderful! All is well here. Just returned from Georgia – grandson’s 13th b-day. I will be returning in two weeks to enjoy granddaughter’s 10th b-day and then on to DC for a fun visit seeing retired and employed friends around the Beltway. My tail is thumping about being back in VA and MD. I KNOW Christmas time in Italy will be spectacular. I look forward to more tid bits. Hugs to you both and pet the kitties. You are gadding about, aren’t you? Good times! We spent last Christmas in Rome, so it will feel very familiar this year. Happy travels! Wow, you have really made it homey. The rugs really add warmth to the place. Thanks for sharing your comfortable abode with us. Thanks Diana. Home is where you make it!